Being on a wheelchair did not prevent Dr Siju Vijayan from dreaming, or for that matter, from realising his dreams. 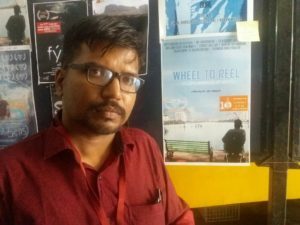 On 17 June 2017 at the International Documentary & Short Film Festival of Kerala in Kairali theatre at Trivandrum, several of us at Pallium India had the privilege of attending the premiere of his short film, “Wheel to Reel“. The film has been selected under the category “short documentary”. You might remember that the short film on palliative care, “Lighting up Lives” was also his directorial venture. 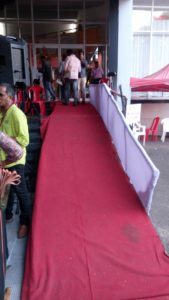 The pleasure of attending the event was augmented for many of us because the organisers were empathetic enough to construct a ramp so that the director of “Wheel to Reel” as well as other attendees could wheel themselves in and attend the event. Festival director Kamal, artistic director Bina Paul and executive director Mahesh Panju, we applaud your essential humanity and sensitivity to others’ dignity. © Copy Right - 2017 - Dr. Siju Vijayan. Travel theme. Powered by Blogger.